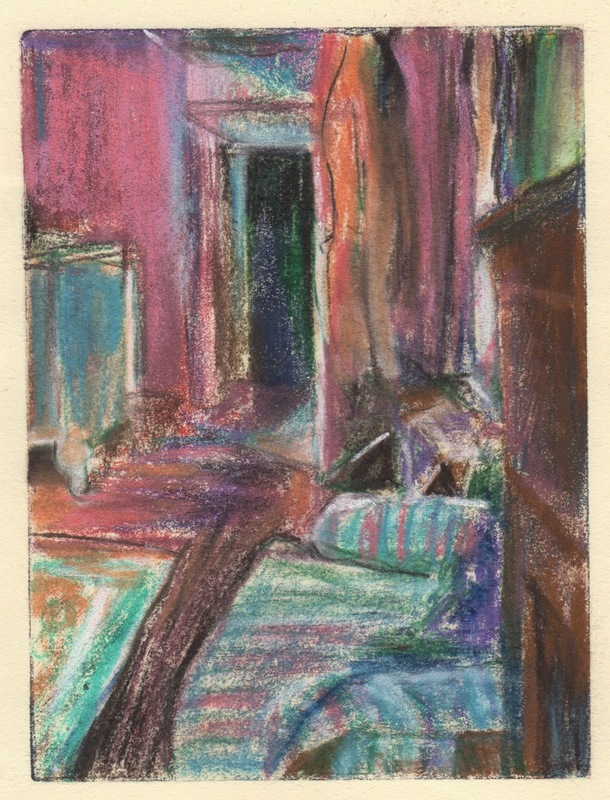 Light from Dairy, monotype: Akua Itaglio on paper 6 x 8"
As I continue to investigate the light around corners in our house, I keep consulting Vuillard. 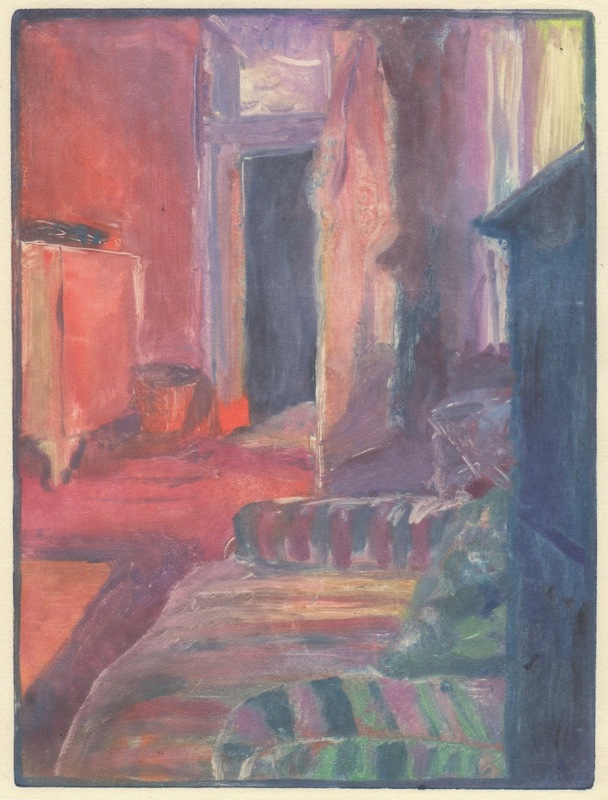 But I'm finding that I'm starting to listen to the monotype and use colour the way it demands, rather than slavishly laying Vuillard's colour=light onto my view. The image below, Mother and Sister of the Artist got me started with finding darker darks. I began fairly faithfully and then felt that the wall needed a magenta and then, of course everything had to accomodate that. I also found I needed to edit, add and embellish my view. Maybe figures soon? 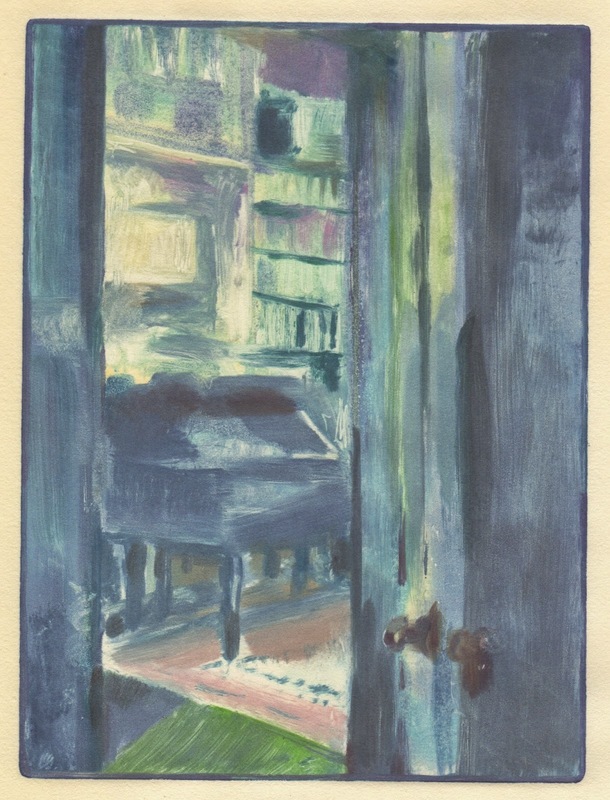 Light From Above Piano, monotype: Akua Itaglio on paper 6 x 8"
This print was actually made before the one above. 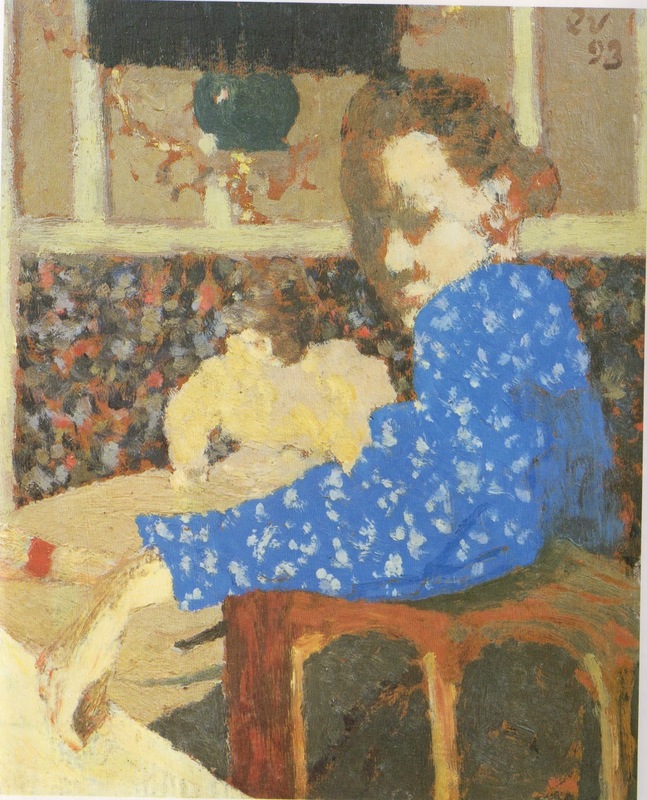 You can see that I was little more faithful to Vuillard's pallette. I have painted and drawn this view repeatedly in the past. This medium seems to solve it more for me. I include this last drawing to show that as I said in an earlier post there are many prints that I pull back the blanket to in disappointment. 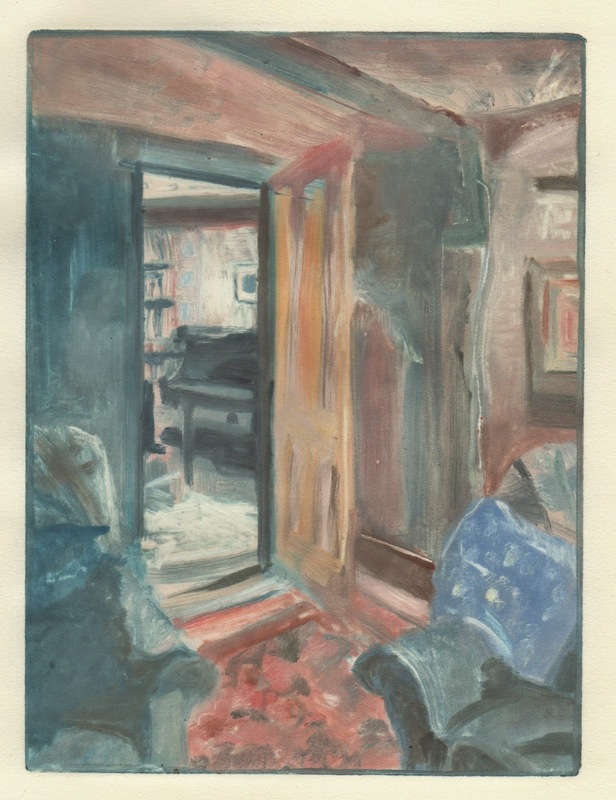 Light from Upstairs Window, monotype: Akua Itaglio on paper 6 x 8"
And those disappointments hang around. One way I've found to banish them is to work back into the print In this case I used my first pull. I often soak up the ink after I've sketched the structure onto the plate, to check it, that's my first pull. This was one of those totally unfinished prints. The problem is the pastel doesn't like the printmaking paper, but in this case I like the scratchy effect. It is not even remotely related to the intention of the monotype but the disappointment is further away. For every satisfying print there a handful of disappointments. It comes back to the tension between light and colour, for me. I am planning to do a few black and white prints to work in tone to convey light, but the thing is, I LOVE COLOUR, so marrying those two things is the ideal. 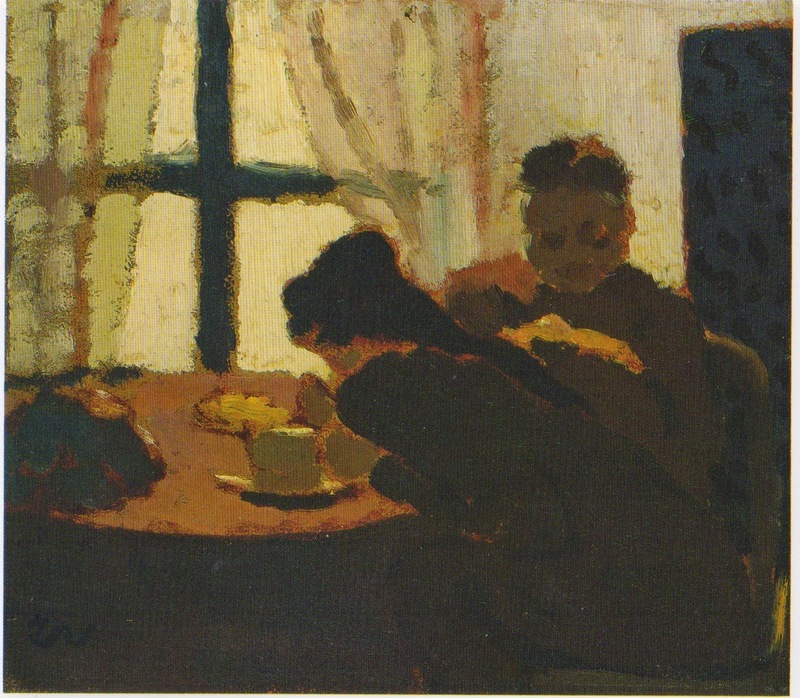 Today I consulted Vuillard. 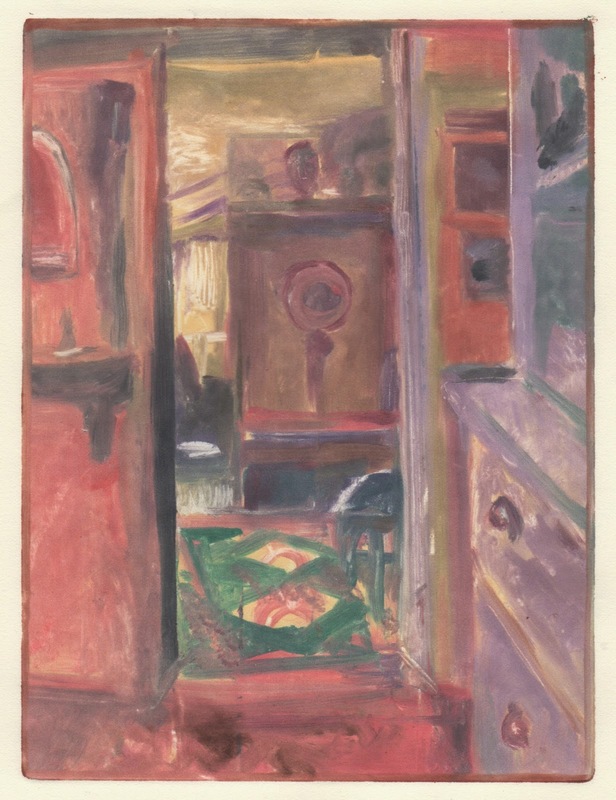 Wonderful Vuillard who tells stories with rooms using light and colour. I think he helped. 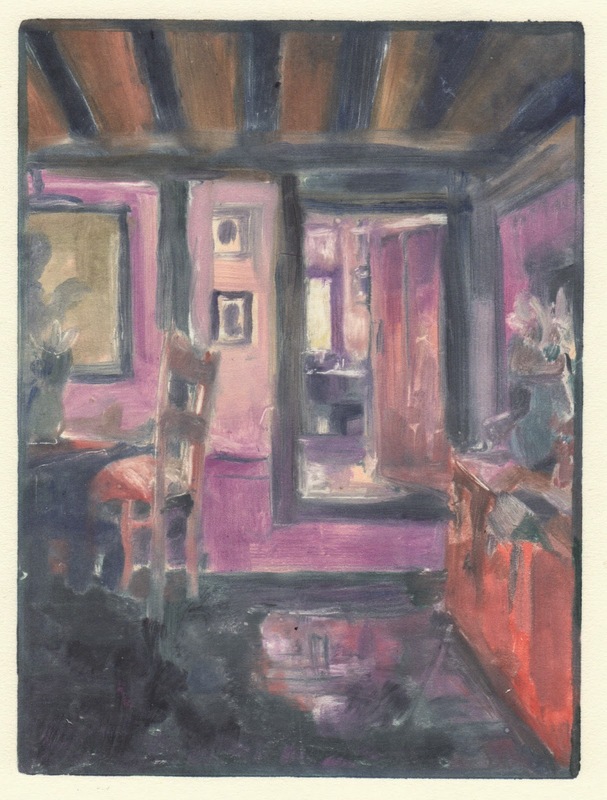 Light in Hallway: monotype Akua Itntaglio on Rives BFK 6 x 8"
I'm starting a new series! And today is the first day I've had in more than a month to work for most of the day. I have been wanting to get back to monotypes, to really explote the water-based inks and to use what I've learned from Diebenkorn, fused plastic and my recent pastels. One day last month it hit me as I was coming around the corner of our living room that light around corners is related but not specific to the work I've been doing and would be an exciting aspect of my world to study. Today, especially this morning when I got to work, it was dark, even though it should have been light and I seized the opportunity to go around the house looking at the light around the corners. I took lots of photos. I decided to flick throuhg my Hiroshige book to look for colour inspiration. The spread below felt like the day, and I liked the wedge of green, so that's where I began. I got the room prepared, for the first time since I've had the press! I cleared off surfaces, made a wetting station, a working station and adjusted the press, even re-filed the edges, changed the paper, etc. If I don't begin at the beginning, I don't take the work seriously, and I rush. I am delighted with the colour of the print! The ink has potential, even if it doesn't do quite what oil-based ink does. I also used plenty of brushes and found cleaning them and using them immediately after cleaning straightforward for the first time. I used hot water with the soap!